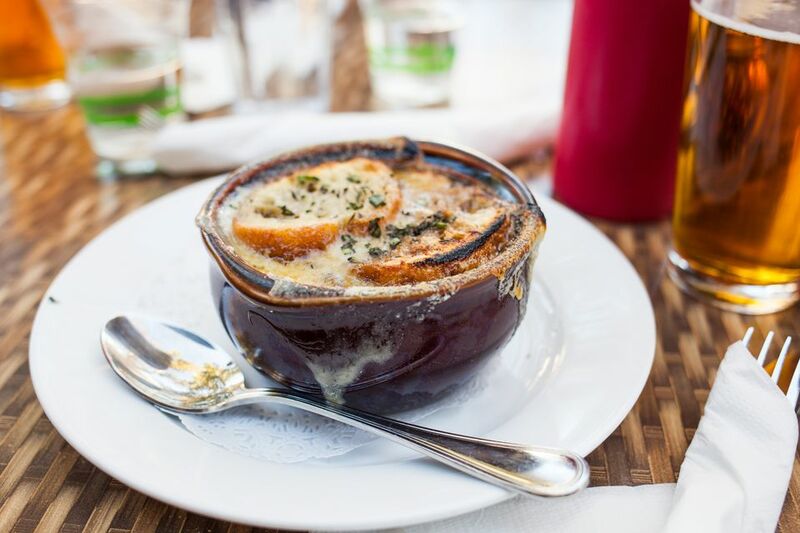 This classic recipe for French Onion Soup is a gluten-free version of "Gratinéed Onion Soup" from Rebecca Franklin. This soup has all the richness and flavor of the original classic but without gluten. Use homemade beef broth and homemade gluten-free bread for flavor. Alternatively, you can use ready-made gluten-free beef stock and gluten-free salad croutons for great convenience. Heat butter and olive oil in a large stockpot over medium heat. Add sliced onions, sugar, salt, and pepper to the stockpot. Cook the onions for 30 to 35 minutes, stirring occasionally until onions are caramelized and golden brown. Sprinkle flour over cooked onions, stir and cook for about 90 seconds. Increase heat to medium-high and add beef stock, wine and sherry to onions. When the soup begins to boil, immediately reduce heat to low, cover stockpot, and simmer for 30 minutes. To make the croutons, use a round biscuit cutter to cut gluten-free bread. Broil the bread slices on low for about 3 minutes on each side. Watch closely to avoid burning the croutons. They should be dry and lightly toasted. Rub each crouton on both sides with the cut side of the raw garlic clove and brush with olive oil. Return the bread to the broiler and toast for 2 more minutes on each side, just until golden brown. Preheat oven to 450 F/232 C. Place ovenproof soup crocks on a baking sheet for safety and easy handling. Ladle soup into the crocks and place 2 rounds of gluten-free bread or 1/8 cup of commercial gluten-free croutons on top of soup in each bowl. Evenly sprinkle cheese on top of the croutons. fully place baking sheet with soup crocks in preheated oven for 12-15 minutes or until is a bubbly golden brown. Serve immediately.